EDINBURG — It was a shooter’s paradise Friday night at Bert Ogden Arena. 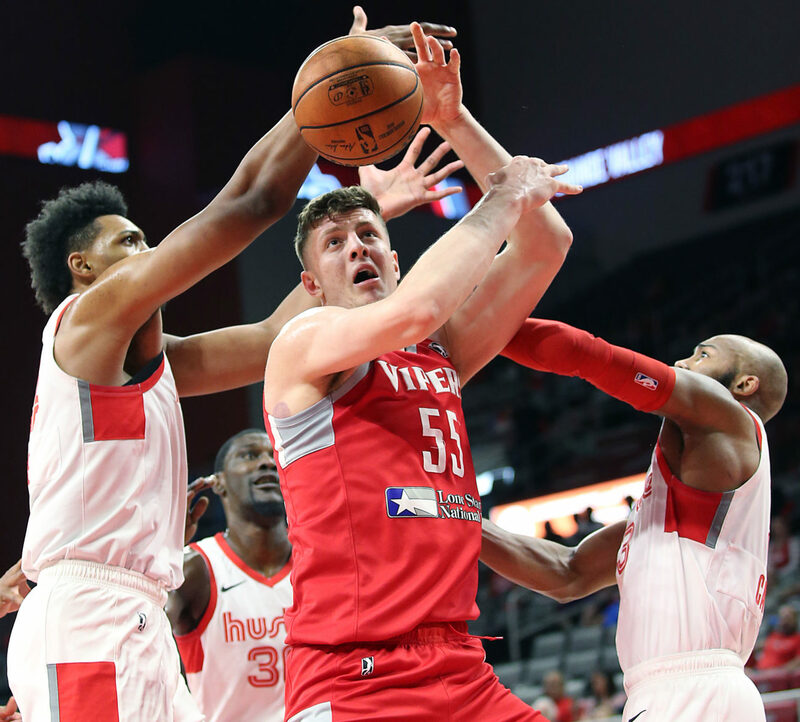 Fortunately for the RGV Vipers, they outshot, outrebounded and outplayed a strong Memphis squad en route to a 135-118 victory in the second round of the NBA G League playoffs. The Vipers will play for the Western Conference championship Tuesday at home against the winner of Oklahoma and Santa Cruz. The winner of that one-game series will advance to the G League finals. On a night when the Vipers’ Michael Frazier was awarded the G League’s Most Improved Player award, he showed why, knocking down 9 of 14 3-point shots, pulling down eight rebounds and finishing the night with a game-high 33 points. The Vipers connected on 20 of 40 3-point attempts (50 percent), while Memphis shot the lights out, as well, converting on 19 of 39 attempts from beyond the arc (48.7 percent). Overall, Memphis shot 50 percent from the field, while the Vipers finished at 49 percent. An Achilles heel for the Vipers throughout the season has been free-throw shooting, but they were dead on from the line, connecting on 17 of 19 from the stripe (89.5 percent). “God is good,” Blair said. Speaking of Achilles, Friday marked the return of 7-foot center Isaiah Hartenstein, who had missed the past few weeks recovering and rehabbing from an Achilles injury. He scored 22 points, pulled down 15 rebounds and kept the crowd alive with four dunks and was 2 for 5 from the foul line. The teams played close during the second, third and fourth quarters as RGV outscored Memphis 98-94 in the final three periods. However, the Vipers outscored Memphis 37-24 in the first quarter and never trailed the entire game, jumping out early to a 7-1 lead on a pair of Hartenstein dunks and a Vince Edwards 3-pointer. Houston Rockets general manager Daryl Morey enjoyed the game from his front-row seat. Morey, who has been the Rockets’ GM since 2007, said he suspects many of the players on the floor Friday would not be there too much longer. “You’re going to see several of these guys in the NBA,” he said. “If you play well here, you will be in the NBA, that’s the bottom line. It’s the most scouted league now — more than college now. The Vipers ended up with six players scoring in double figures. After Frazier and Hartenstein, Edwards scored 14, Chris Walker added 12, Jordan Johnson and Dakari Tucker chipped in with 10 apiece.